This Android App captures the fun of solving maze puzzles without pencil and paper. There are Demo and Full versions available on the Android Market. Maze Tracer has a wide range of difficulty levels to entertain preschoolers and kids while providing enough of a challenge for adults. Aiming to be the most user friendly maze game in the Android Market. All the fun of a classic pencil and paper maze without the pencil or the paper. Customizable with several color themes and other user preferences. Maze Tracer simulates tracing a path through a pencil and paper maze puzzle. Trace a path through the maze from the start to the goal using your finger. If you hit a dead end, you can backtrack to any point on your trace. The backtrack will change to an alternate color. The Maze Level determines the complexity of the Maze. The lowest levels are designed for preschoolers and young kids to learn how to solve a maze. The highest level mazes should be complex enough to challenge adults. You can start at whatever Maze Level you want. When you complete the last maze at a level, the game will automatically advance to the next level. Maze Tracer has 1000 mazes (25 at each level) and also allows you to play an unlimited number of randomly generated mazes. Level 1 Maze Level 40 Maze The pre-defined mazes are numbered and your fastest solving time will be recorded. 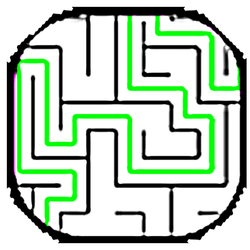 The fastest solving times are visible on the maze selection screen. The default color theme is Pencil and Paper. It works well in bright light. The Night color theme is for playing in the dark. The Neon color theme is for moderate ambient light. You can also customize the colors using the Custom color theme. Multitouch On devices that support multitouch, if you would like to be able to zoom in an pan a complex maze, enable Pinch-to-Zoom and Two Finger Pan in the Options. This will make it easier to trace a path through a complex maze on a device with a small screen. You can set the Wait Time Before Next Maze (sec) to control the time it takes to advance to the next maze after you solve one. You can also set the Show Solution Speed (steps/sec) to control the number of steps the automatic maze solver shows per second. Thanks for playing Maze Tracer!